Are Japanese Hopping Robots Safe on Asteroid Ryugu? 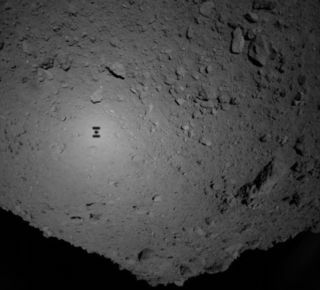 Japan’s Hayabusa2 spacecraft captured this image of the asteroid Ryugu (and its own shadow) on the night of Sept. 20, 2018, when the probe was about 440 feet (135 meters) above the space rock’s surface. Hayabusa2 was descending at the time, preparing to deploy the two tiny MINERVA-II1 hopping rovers toward Ryugu’s surface. Two little hopping rovers appear to have hit their asteroid target, but it's still unclear if they're safe and sound on the surface. The MINERVA-II1A and MINERVA-II1B minirobots separated from their mother ship, Japan's Hayabusa2 spacecraft, as planned at 12:06 a.m. EDT (0406 GMT) today (Sept. 21) and headed down toward the big asteroid Ryugu. "Communication with MINERVA-II1 has currently stopped. This is probably due to the rotation to Ryugu, and MINERVA-II1 is now on the far side of the asteroid. We are currently working to confirm if there are images capturing the MINERVA-II1 landing," the Hayabusa2 team said via Twitter at about 6 a.m. EDT (1000 GMT) today. Being isolated on the far side is just a temporary setback, however. The 3,000-foot-wide (900 meters) Ryugu completes one rotation every 7.5 hours, so the MINERVA-II1 duo should swing into radio view soon if they haven't already. We cannot assume that everything is fine, of course — touching down on an asteroid 200 million miles (300 million kilometers) from Earth is a very tricky business. For example, it's hard to stick a landing on a body with such a slight gravitational pull, as the experience of the European Space Agency's Rosetta mission shows. In November 2014, the Rosetta mother ship dropped a lander called Philae onto the surface of Comet 67P/Churyumov-Gerasimenko, which is about 2.5 miles (4 km) wide. Philae was supposed to anchor itself to the comet's icy surface with a harpoon, but that didn't work, and the lander bounced several times before settling in a shady spot next to the wall of a cliff. Philae didn't get enough sunlight there to recharge its batteries as planned, and the lander's science work was cut short as a result. Hayabusa2 engineers are doubtless doing all they can to hail the MINERVA-II1 bots, but all the rest of us can do is wait. The $150 million Hayabusa2 mission launched in December 2014 and arrived at Ryugu in late June of this year. The deployment of MINERVA-II1A and MINERVA-II1B — each of which is 7 inches wide by 2.8 inches tall (18 by 7 centimeters) and weighs 2.4 lbs. (1.1 kilograms) — kicks off an ambitious surface-exploration campaign at the big asteroid. In early October, the orbiter will deploy a bigger lander, called the Mobile Asteroid Surface Scout (MASCOT). And another little hopper, MINERVA-II2, is scheduled to head toward the surface next year. Also in 2019, the mother ship will send a (nonexplosive) impactor barreling toward Ryugu. The orbiter will then cruise down to the newly created crater and collect a sample of pristine, previously subsurface material, which will come down to Earth in a special return capsule in December 2020, if all goes according to plan. Scientists around the world will study this cosmic grit and gravel, looking for clues about the early history of the solar system and the role that carbon-rich asteroids such as Ryugu may have played in delivering life's building blocks to Earth long ago. This information will be combined with data gathered by the MINERVA-II hoppers, MASCOT and the Hayabusa2 orbiter. The MINERVAs — whose name is short for "Micro Nano Experimental Robot Vehicle for Asteroid" — are designed to hop because traditional roving doesn't work well in very low-gravity environments. A slight turn of a wheel would send a robot up into space, so hopping is the way to go. And these hops will be pronounced, lasting about 15 minutes and covering perhaps 165 feet (50 m) of horizontal distance apiece, Hayabusa2 team members have said. And about the "II" in the hoppers' name: The first Hayabusa mission, which was also operated by the Japan Aerospace Exploration Agency and arrived at the asteroid Itokawa in 2005, featured a hopper named MINERVA. The original MINERVA failed to land safely on its asteroid target.